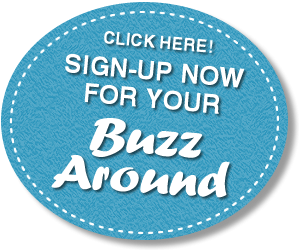 Your advertisement in each of our Buzz Around Newsletters directs your message to your neighborhood. Our subscribers look forward to reading our newsletter. They love the good news and your ad is right there in the middle of it! All advertisements are spread throughout the newsletter & rotated weekly. Your business featured prominently with a designer background color & pictures. 735-pixel x 250-pixel spaced ad with graphic / photo (s) & maximum 4 links. Your advertisement, your way. (3 week run, min) We guarantee your price will be 10 cents / each ad view. Group discounts : 3 towns $155 / wk. 4 towns $198/ wk. 5 towns $235 / wk. Our simple & effective way to help you reach new customers. Each ad can be designed by us, including 1 picture or logo of your choice, up to 35 words of information & 2 links. Or you can provide a 310 x 310-pixel image, and we will insert your 2 links below it and to image. Background is yellow. (5 week run, minimum) We guarantee your price will be 5 cents / each ad view, or we will run it until it is! Group discounts: 3 towns $75 / wk. 4 towns $99/ wk. 5 towns $117 / wk.